Greetings to everyone. I want to begin by thanking all those that have helped to see this event happen- well over a year in planning. Appreciation goes to our Women's Federation team in Italy, Flora Gravissano and Elisabetta Calli, who brought us into contact with Mr. Flavio Zanonato and his team, whom we have been working closely with over the last few months. Thank you for the support of our partners and our International Office and European chapters, especially here in Belgium. The theme has become more relevant than ever. We called call this meeting today at the European Parliament in Brussels to provide a platform for the sharing of some extraordinary efforts being made at the international, governmental and local level towards understanding and finding the vaccine for this epidemic of radicalisation of our youth. In order to solve it, we cannot avoid self-criticism. In order to heal it, we have to understand the sickness at hand and the model of health. It is not the first time in our history. The failure of policy and practice in social, economic and cultural integration is clearly an important backdrop to this "revolutionary pull" on youth that has been compared to that at the time of the French Revolution and even the youth element of the rise of Nazi Germany. Director of Research in Antropology at the Centre National de la Recherche Scientifique in Paris, Mr. Scott Altran, was invited to report to the UN Security Council's Counter Terrorism Committee. He explained that a significant number of ISIS recruits in the west actually come from Christian families. Many have had no history of violence, but were radicalized by friends. And perhaps most significant, he went on to say that the "mindless" terrorist leaders that we thought we were dealing with, may actually understand the desires of our youth better than the governments who are trying to. This brings us to a fundamental element in the theme of today's session. Who does know the minds of the youth best? Peers, yes, but even more profoundly, their parents, more specifically mothers. Not only do they know them, but are in a position to monitor them and influence them like no other. We have 7 children and I can see when there is a cloud around one of them. When one of my younger girls became detached, mistrustful of us, my husband and I had sleepless nights. No one can force a change of heart, but her breakthrough was when she came home one night in tears, saying, " you are the only ones who really care about me". That realization changed her. Over 20 years of projects and Peace conferences for Women in the Middle East, I have heard stories from women leaders of how their children or relatives or friends have been radicalized at universities. But I've also heard that due to brothers and sisters and friends reporting to parents about their fears, some could be turned around. Some of these women learned and they went on to spontaneously create "prevention" networks among themselves. The stereotype of a "terrorist" as a foreigner from a disadvantaged, distant country that has no connection to my life has faded. Current statistics show that well over 5000 western youth have made the dramatic decision to join the ranks as ISIS fighters. The breaking news stories of the three teenage girls from Bethnal Green, England who dropped out of university to fill positions as brides of ISIS fighters shocked us. According to Oxford University, social networks rank high the process of radicalisation, but friends or peers played the primary role in the recruitment of three-quarters of foreign fighters to ISIS. Family members accounted for a fifth, mosques for just one in 20. Those decisions were not made quickly, but began with disappointment, insecurity, confusion that came into contact with the wrong elements and grew like a bacteria. How many more young men and women may be in the process of coming to such conclusions? There is no single cause and there is no simple solution. The same places that may have contributed to the problems can also be the birthplace of solutions: home, school, work, media, culture, religion, government. That's why we, all concerned elements, have to talk. Why are the promises of ISIS leaders able to take root in the minds of our European youth? Natural qualities of youth are hope, passion, expectation and vulnerability. Some of our youth have become frustrated in their attempts to lead meaningful, exciting lives. If we really do consider ourselves as a European family.."committed to working together for peace and prosperity"- as stated on the EU homepage, we can find solutions. Families do that, they don't give up- and don't "leave anyone behind". That telling quote from a Disney animated film has taken on a new dimension since it was recently quoted in the Preamble for the UN Sustainable Development Goals. WFWPI has been involved in the discussions leading up to the Declaration on "Transforming Our World- the 2030 Development Agenda". There is so much hope and there are so many possibilities for youth to contribute to a brighter future. They do not want to be mediocre. They want to dream big and find realistic ways to make those dreams come true- as those jihadi leaders seem to know well. I just came back from a UN NGO conference in Korea entitled, "Educating for Global Citizenship: Achieving the Sustainable Development Goals Together." Over half of the 500 participants were under 30 years old. WFWP brought over 40 young women to participate. What creative and brilliant ideas they have, especially as they stimulate one another in a positive direction. How transformed are their lives to find themselves involved in platforms and negotiations that hope to chart a brighter future for our planet. One couldn't imagine a better dream! For months in advance and still now, the mails and links being sent around among them were focused on the five keywords words of the Agenda: people, planet, peace, prosperity, partnership. Discussion groups focus on: ending poverty and hunger, reducing inequalities, promoting decent work, ensuring quality education, making inclusive and safe communities, empowering youth. Our failures in these areas are part of the reason for radicalisation. How can we mobilize and build communities around these shared values? There are youth in most nations already offering their ideas to this campaign through twitter, instagram, facebook. Can we not find a way to guide our searching youth to those websites? Can we not engage our youth to help us find more creative, attractive programs? This is just what young Ahmed (15 years old) said to me when I interviewed him at the Human Rights Council in Geneva last week. Born in England to Iraqi parents, he and his cousin Yarah were invited as panellists in a debate on "The dangers of ISIS in Iraq" because of their project "#No2ISIS". Both are convinced that if forewarned about the lies of the radicalising indoctrination and provided alternatives lifestyles, the promises of ISIS will not be so alluring, even to dis-enfranchised youth. At the end of the interview, I asked Ahmed why he was not attracted to ISIS. He said that he was raised in a family where his parents stayed involved in his life, providing a good education. He saw an example of authority and leadership in his parents and would compare that to other authority alternatives. "But, not everyone has those opportunities", he said, and "that is why I am doing what I am doing". We have to look at our education systems, formal and informal. UN and governments speak of quality education. But we may not all agree on that definition. Education at home should lead to public education, which then reinforces it. We must agree not only on academic choices, but also the core values that remain the pillars we hope our youth adhere to. The professionals who guide our youth during school hours must also be accountable to the primary nurturers and experts in local knowledge, the parents. Both parents and teachers should strive to be models, not just imparters of knowledge. It is confusing for youth. As we see here today, the UN, governments, NGO's, religious leaders, academia, educators and others are trying. We want to include the role and voices of women, especially mothers in this discussion because they have proven their commitment and their effectiveness. Under appreciated for their "local expertise" in such a forum, they may benefit from training. One of our tenets at WFWP is that: "The role of women in leadership is crucial, not just because we are over 50% of the population, but because of the primordial role of women as mothers in the microcosm of the Human Family, the natural family". Europe is at a crossroad: seeking to balance the individual and collective needs, our need for interdependence without loosing our sense of independence. Yesterday's BREXIT debates here highlighted that. We are being confronted with demands to open wide our doors and share our home and our privileges. The founding principles of our union, as well as our personal convictions make us want to respond generously, but find our capacities overwhelmed. Looming are the serious concerns related to the successful integration of our increasingly multicultural societies. If done well, the benefits all around are great, but if not, the sense of exclusion and dissatisfaction can be a breeding ground for more serious concerns. No matter how protective we are of our children, we send them out every day. Governments alone cannot solve these issues. Our concern and our engagement has to begin in civil society, within each family. Radicalisation, or any disengagement from social and civic participation happens over time and is preventable at early stages. But are we looking, feeling responsible outside our small immediate concerns? We can only imagine what positive impact that same radicalised individual might have had in society if those energies were funnelled constructively. The underlying desire of our youth is to be relevant, to make a difference. We have great minds and hearts working on these issues, but there are gaps. Our religious and cultural influences and the authorities representing them also have an important responsibility to provide a vision and model for peaceful, cohesive communities. Similarly, our educational institutions, and the curricula that frame them will play a significant role in providing incentive for good citizenship and wise governance. How can we decide together and work together towards a vision of healthy, inclusive families and communities where "no one will be left behind?" Mrs. Handschin-Moser is overseeing the development of WFWP (www.wfwp.org) in Europe. Before becoming the Director of the UN Office for WFWPI, she led its advocacy team at the United Nations in Geneva for 19 years, focusing on peace and human rights through the empowerment of women and girls and protection of the family. Her concern for youth led her to found the WFWPI-UN Internship program in Geneva in 2005, where she is the Director. She has been the co-coordinator of the Middle East Women’s Conference Series for 12 years. 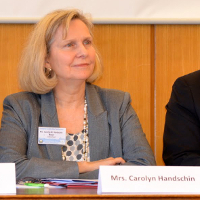 Mrs. Handschin is also co-founder of the Geneva Interfaith Intercultural Alliance (www.giia.ch), a youth Model UN Interfaith Council Program. She has seven children, three granddaughters and a supportive husband who are a resource and inspiration for her work. « Djihâd », does it have a gender?